In 1967, preceding the Six Day War, the Rebbe introduced what was to be the first of the ten "mitzvah campaigns" ("mivtzaim") — the campaign to don tefillin with all Jews. At the time, an acquaintance asked me why the Rebbe had chosen particularly tefillin. "Why not a more universal mitzvah, such as kosher?" he asked. Later that year, when in yechidut (as a private audience with the Rebbe is called), I asked the Rebbe why he had chosen tefillin. The Rebbe told me that there were two reasons for his choice. The first reason is that there is a passage in the Talmudic tractate of Rosh Hashanah which says that once a Jew wears tefillin on his head — even one time in his life — he falls into a different category as a Jew. 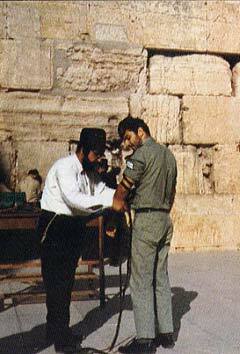 The second reason the Rebbe gave was that, "When a Jew in Miami sees pictures of Jews at the Western Wall wearing tefillin, he gets an urge to put on tefillin himself." In 1974, I received a call from an American who many years previously had been doing business in England and had been a client of my accountancy firm. This person was now in business in Miami, and his firm's accountant wanted to discuss certain aspects of their business with me. Would it be possible for me to come to Miami and have a meeting with him? I agreed and some weeks later went to Miami. I arrived very late at night; we had scheduled an early breakfast meeting for the next day. I stayed in an apartment adjoining that of my client. The next morning my client's partner, thinking that, being jet-lagged I might oversleep, knocked at my door and receiving no answer came in to wake me. He saw me praying in prayer shawl and tefillin and went out. The American accountant, who was Jewish, arrived for the meeting and everyone sat down to breakfast. I only had some orange juice. The accountant enquired why I wasn't eating and my client said that I only ate kosher. The American accountant expressed surprise, so the other person related how he went to call me for the meeting and found me praying in a prayer shawl and with 'things' on my head. "You put on tefillin?" the American accountant asked. "Yes!" I answered. "Don't you?" "I haven't put on tefillin since I was Bar Mitzvah in New York fifty years ago," he said. "But recently I saw a photograph of Jews at the Western Wall wearing tefillin and had an urge to put on tefillin myself." Almost the exact words that the Rebbe had said to me more than seven years earlier. After the meeting he put on tefillin in my apartment. This is a great story! I enjoyed it.